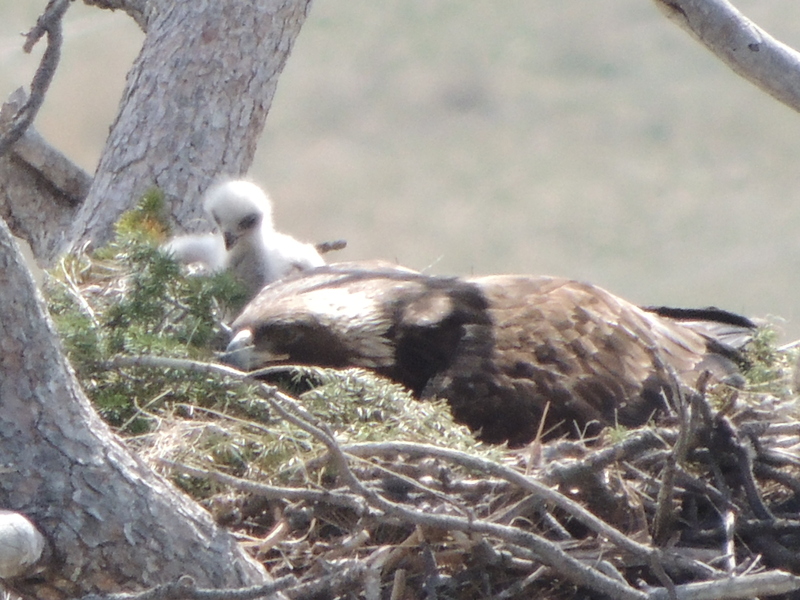 I’m sitting on the side of a steep hill, scoping out a stunning Golden Eagle nest. 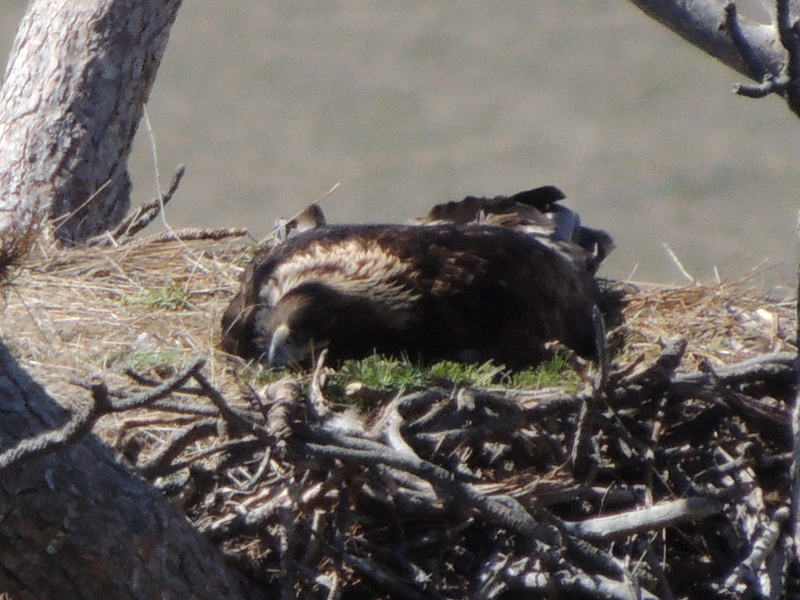 The eagle in the nest is doing the same thing she’s been doing for the past 6 weeks – laying in the nest. It’s been 42 days, and I’m beginning to worry that this nest is going to fail. I take one more look, and see a little fuzz of white moving around behind the eagle. 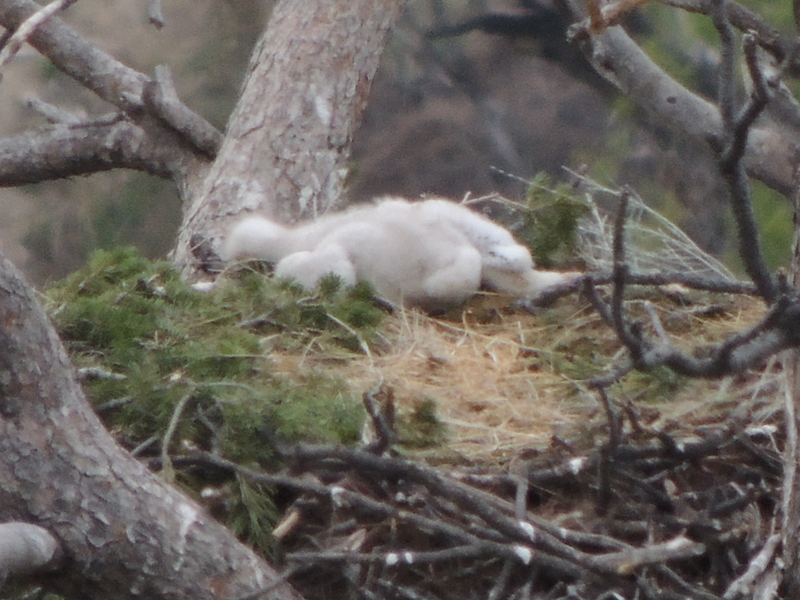 I look again, and – hooray – it’s an eaglet! Success. I feel like a proud grandparent. The little guy starts throwing himself around the nest until I’m sure he’s going to tumble over the side. But he stays safe. I was lucky to find this nest. 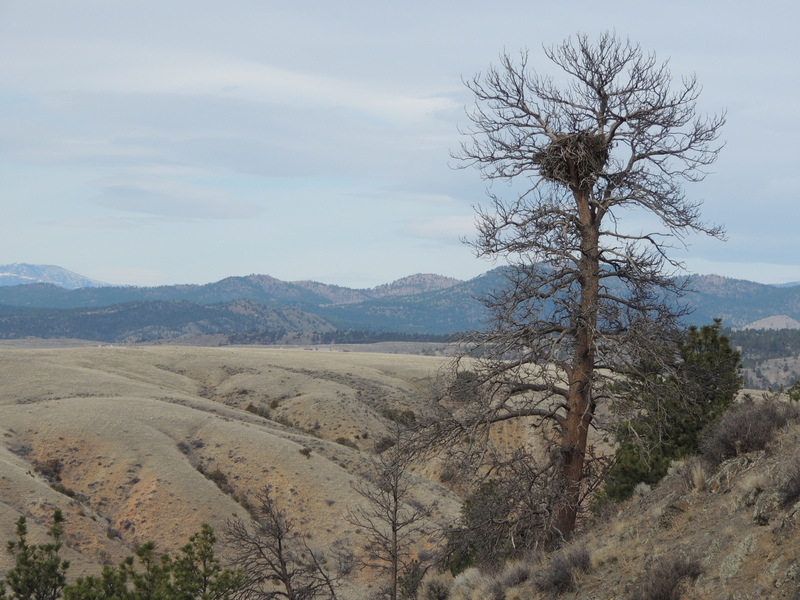 I’ve seen Golden Eagle nests before, but they’re usually high up on cliffs, and seeing what’s going on in the nest is nearly impossible. 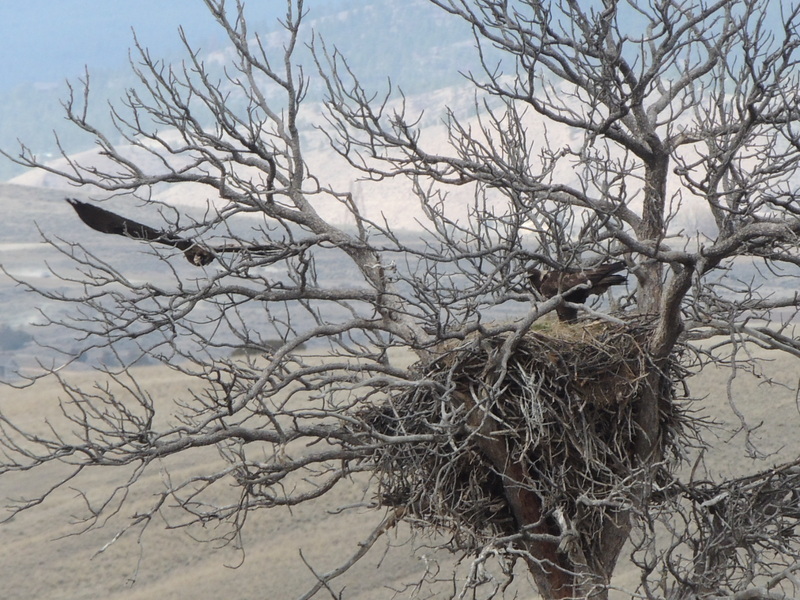 But this couple built their nest high in a dead Ponderosa pine overlooking the Helena valley. 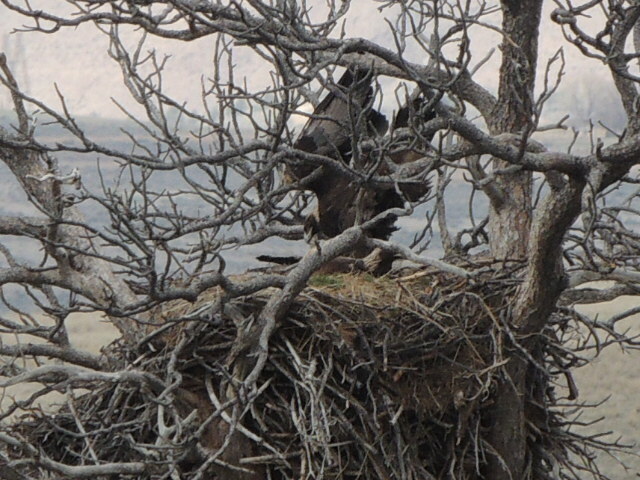 I could climb above the nest and safely keep an eye on the eagles. Since March 20, that’s what I’ve been doing. It’s a spectacular setting. 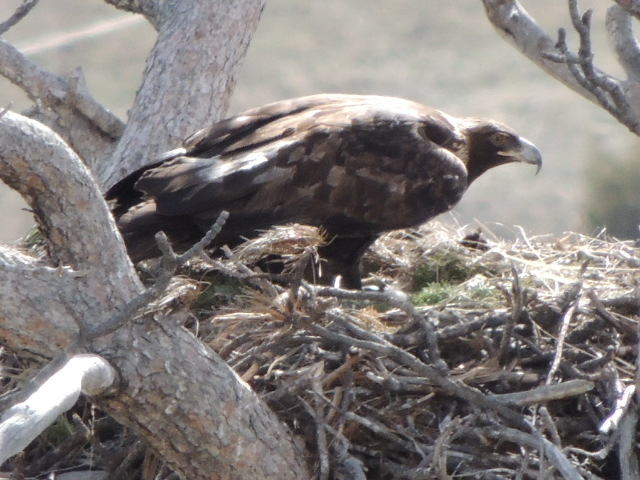 Unlike Bald Eagle pairs, who take turns sitting on the nest, the Golden Eagle female does the majority of the incubating. The male’s job is to bring her food. In my many weeks of watching the nest I only caught the male bringing food to the nest one time, and he didn’t hang around long after he dropped it off. 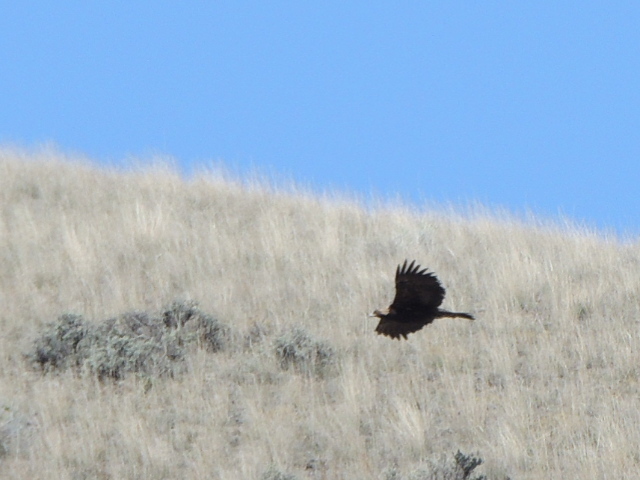 I could usually see the male soaring above the valley, while the female sat. And sat. She would occasionally stand up for a stretch, but she was sure patient. I was patient, too. Although it’s not exactly hard duty, hanging out on a gorgeous hillside taking in the view. 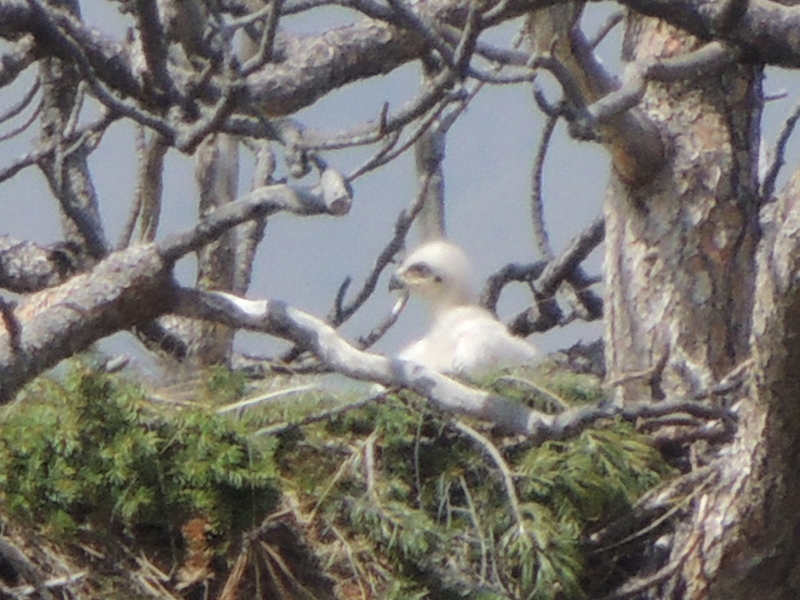 I first saw the eaglet on May 4. He’s still a fluffy white ball, but he’s changed from a baseball to a softball to almost as big as a volleyball. The parents are doing a good job. Fingers crossed that he stays safe! 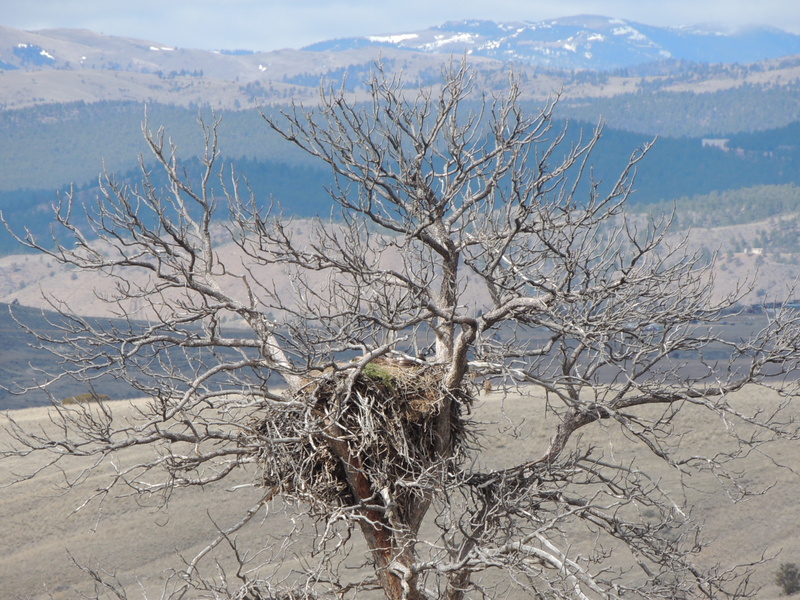 This entry was posted in Birding, Montana, Nature, Wildlife and tagged Golden Eagle babies, Golden Eagle nest, Golden Eagles. Bookmark the permalink. I do feel privileged – and lucky! Thank you. Wow! How cool is this!?! 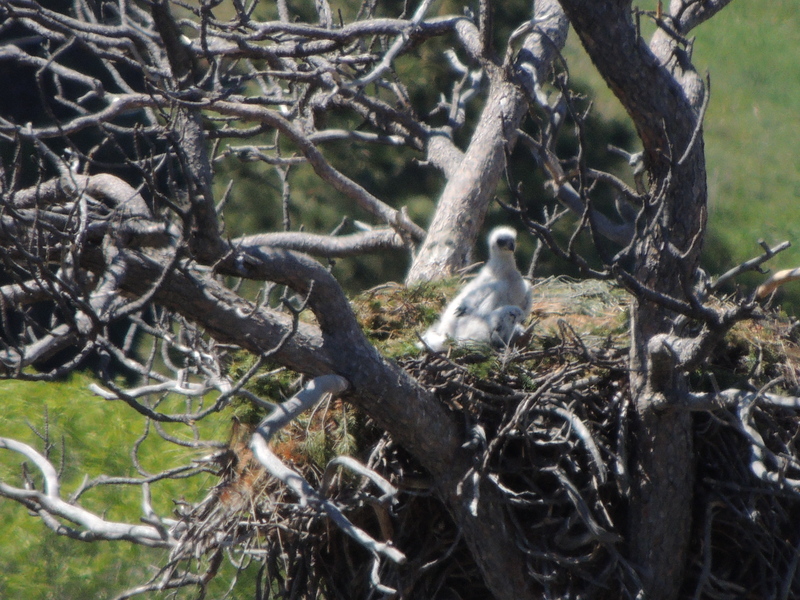 Watching nesting birds is very special — good for you to match the patience of the parents so you could spot the little one when it finally emerged 🙂 Be careful or you’ll experience a very literal “empty nest” syndrome when it fledges! Good point. I’d better get prepared! Thanks. Brilliant photos! National Geographic may come calling! Marvelous! Fabulous! What else can I say? Thanks for letting me have a glimpse into this world. Golden eagles are pretty rare around here… a few days ago, I was watching 20-25 bald eagles for an afternoon (all within 5-6 miles from my house) but your close up views of the tiny white ball of fluff topped that. 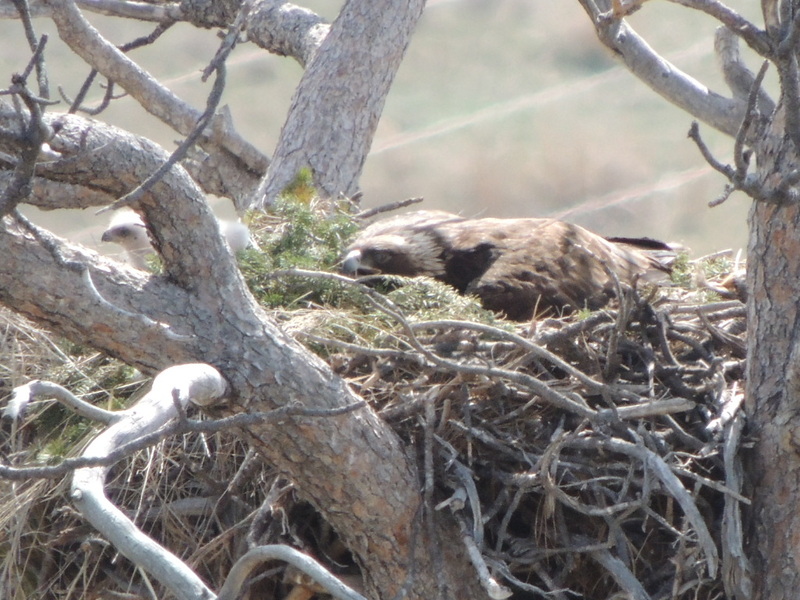 Golden Eagles are pretty rare here, too, so I was pretty excited when I found these guys. Thanks! What a joy to watch that scene before you. That would get your attention! You possess a lot of patience, too. There’s a reason I don’t do wildlife photography. I always enjoy your spectacular images. My daughter and husband don’t always see the patient side of me, that’s for sure! Thanks so much.